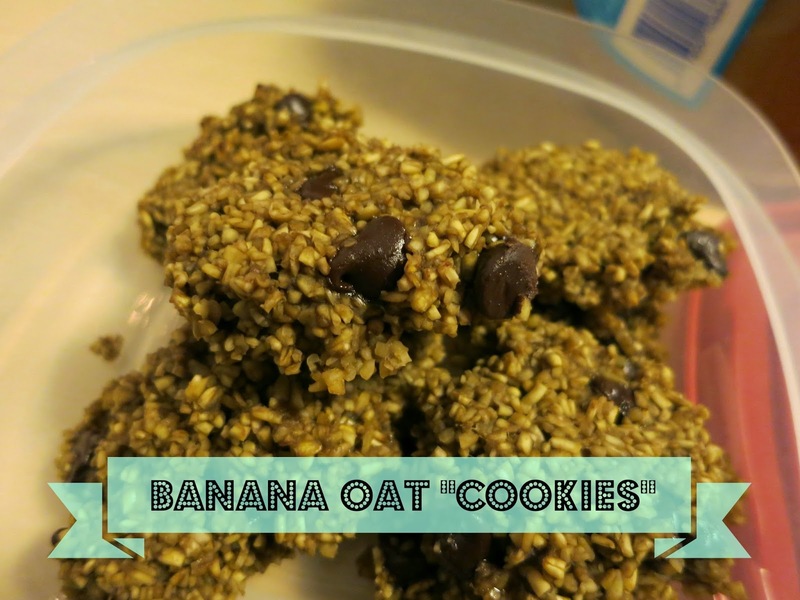 Stnkrbug: Healthy Snacks: Banana Oat "Cookies"
When I was younger, I actually really hated oatmeal cookies. It hasn't been until the past couple of months that I have really been able to appreciate oatmeal and food that contains oats. Being at college ,though, I have realized that oats are so good for you and easily fill you up! They make for a great snack because a little bit fills you up for a long time. That's why today I'm going to be talking about these Banana Oat "Cookies"! Break up the bananas into large chunks and put them in the bowl. This makes the next step a little bit easier! Using a fork, mash the bananas up and mix them with the oats. Make sure all of the bananas and oats are incorporated! This may take longer than you think. Mix in a handful of chocolate chips (or anything else you would like), making sure they are evenly dispersed throughout the mixture. Place the cookies on a greased cookie sheet about an inch or so apart. They don't expand, so you don't have to worry about having them super far apart! Mmmmm look at that cookie. Bake them for 15 minutes in a 350 degree oven! So this is totally optional, but you can "frost" these cookies with peanut butter before eating them! I did this because I am addicted to peanut butter, and ohmygosh did it taste amazing!! What are your favorite kind of healthy cookies? Even though they look like bird food, I had one of these and they are actually delicious (especially with peanut butter. It really masks the banana flavor.)!! Hehehe I love my bird food cookies. These look amazing! I will try the recipe this weekend I think as I need something to do :) Great post!! Ou they look so good! I love oatmeal! Yeah I'm just now starting to love it - haha I've ben missing out!! I'm going to make these and let you know how they turn out! These look amazing!! I love oatmeal based cookies - they make great snacks to wrap up for taking on a hike. Like delicious bundles of fuel! Yeah definitely!! These would be so perfect for hikes! Yum ,these look pretty delicious for being healthy! :) I've never tried cooking with those types of oats but it's something I'd like to try! Thanks for sharing the recipe!